G-TRACE (GAL4 Technique for Real-time And Clonal Expression) stocks allow one to generate cell clones that provide spatial, temporal and genetic information about the origins of individual cells. The method is described in Evans et al. 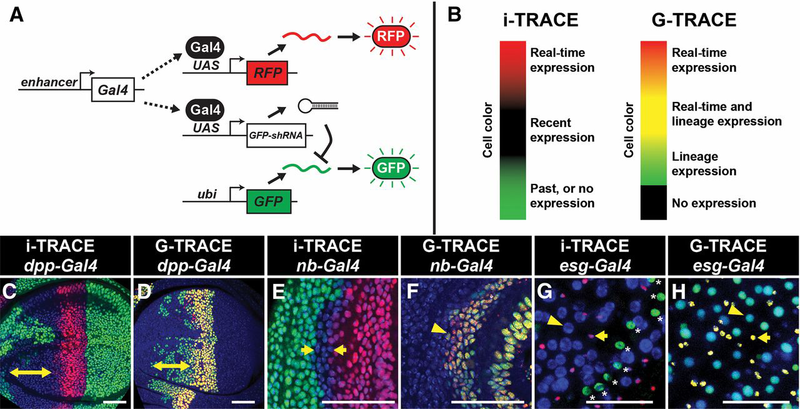 (2009): G-TRACE: rapid Gal4-based cell lineage analysis in Drosophila. Nature Methods 6: 603-605. 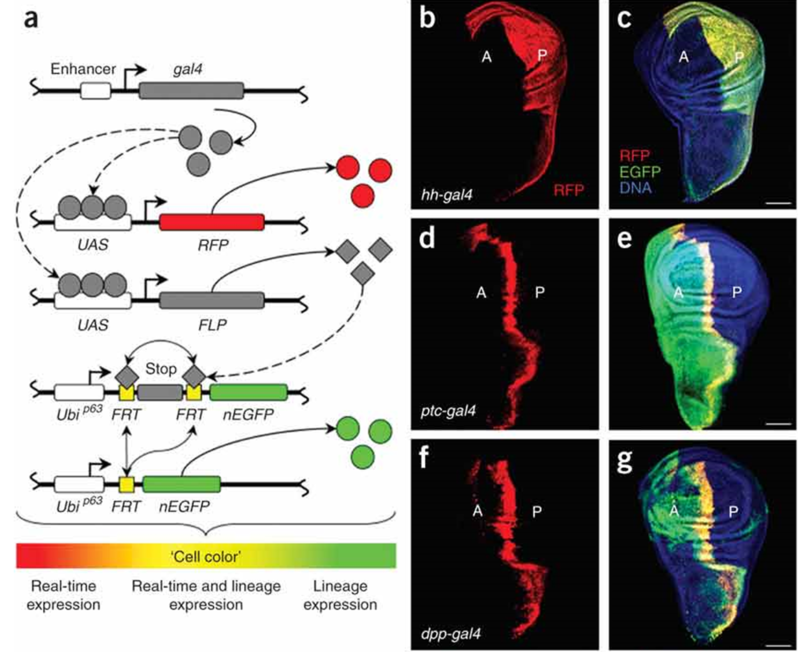 In the figures below, RFP shows cells currently expressing GAL4 while GFP shows cells that are descendants of cells expressing GAL4 at any time in the history of the lineage. i-TRACE (RNAi Technique for Real-time And Clonal Expression) takes advantage of the persistence of RNAi effect to report past and recent events in a given lineage. Transient expression of EGFP shRNA generates persistent knockdown of GFP (as a result of slow degradation of shRNAs and/or their siRNA derivatives) (Bosch et al., 2016). When the UAS strain (66387) is crossed with a GAL4 strain of choice, F1 progeny contain cells and tissues that report real-time GAL4 expression (RFP[+], GFP[-]) and recent GAL4 expression (RFP[-], GFP[-]). This method is described in Bosch et al. (2016): Persistence of RNAi-Mediated Knockdown in Drosophila Complicates Mosaic Analysis Yet Enables Highly Sensitive Lineage Tracing. Genetics 203(1): 109-18. The figure below illustrates the similarities and differences between i-TRACE and G-TRACE.